I was browsing on Pinterest this morning and found a pin for a project you would work on with older grandchildren to help them make really wonderful gifts for their parents for Christmas (which is just a touch over four months away!). What is this, "wonderful gift"??? Woven baskets! 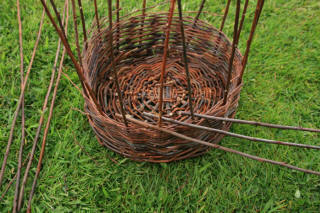 Follow this link for info on the supplies you will need, how to find them, prepare them and then a photo tutorial to follow in making your own willow baskets! It looks like a lot of fun - when my grandchildren are a couple years older, we might try it! I might try it on my own, too, because, who doesn't enjoy a lovely basket??? What do you think? Have you made baskets before? Might you try this one? Enjoy!